We present detailed procedures to produce experimental equilibrium curves of the phase composition as a function of solvent concentration in a solid state system under milling conditions. Belenguer, A. M., Lampronti, G. I., Sanders, J. K. Reliable Mechanochemistry: Protocols for Reproducible Outcomes of Neat and Liquid Assisted Ball-mill Grinding Experiments. J. Vis. Exp. (131), e56824, doi:10.3791/56824 (2018). The equilibrium outcomes of ball mill grinding can dramatically change as a function of even tiny variations in the experimental conditions such as the presence of very small amounts of added solvent. To reproducibly and accurately capture this sensitivity, the experimentalist needs to carefully consider every single factor that can affect the ball mill grinding reaction under investigation, from ensuring the grinding jars are clean and dry before use, to accurately adding the stoichiometry of the starting materials, to validating that the delivery of solvent volume is accurate, to ensuring that the interaction between the solvent and the powder is well understood and, if necessary, a specific soaking time is added to the procedure. Preliminary kinetic studies are essential to determine the necessary milling time to achieve equilibrium. Only then can exquisite phase composition curves be obtained as a function of the solvent concentration under ball mill liquid assisted grinding (LAG). By using strict and careful procedures analogous to the ones here presented, such milling equilibrium curves can be obtained for virtually all milling systems. The system we use to demonstrate these procedures is a disulfide exchange reaction starting from the equimolar mixture of two homodimers to obtain at equilibrium quantitative heterodimer. The latter is formed by ball mill grinding as two different polymorphs, Form A and Form B. The ratio R = [Form B] / ([Form A] + [Form B]) at milling equilibrium depends on the nature and concentration of the solvent in the milling jar. Our research focuses on the final equilibrium outcomes of the ball mill grinding process and the role of solvent at equilibrium under ball mill LAG conditions. Indeed, after the ball mill grinding reaction reaches completion, thermodynamic equilibrium is achieved in the two systems we have investigated so far in our system, with a stable phase composition.25 The factors that can affect the final equilibrium are numerous and diverse: ball mill jar size and shape and material, ball bearing size and weight and material, milling frequency, temperature, and solvent nature and concentration. This is evidently the case when the thermodynamic outcome of the grinding reaction changes dramatically in response to a change in the solvent volume added, which can be sometime as low as 1µL per 200 mg of total powder.25 Careful and strict experimental procedures have to be tested and followed in order to achieve reproducible precision and accuracy of the experimental results, from reactants and products storage, to pipetting and mixing pre-milling operations. It is difficult to control or even monitor parameters in a milling jar. Therefore, the use of a mechanical mixer mill (also called vibratory mill), which allows for reproducible and controlled milling frequencies and times, and sealed milling jars are essential. Ensuring that all ball mill grinding reactions reach equilibrium requires some preliminary kinetic investigation of the experimental conditions. The mechanical mixer used for the curves we present here was modified. In order to prevent the jars from warming up through the continuous flow of the exhausts of the motor in the sealed chamber over long periods of grinding, the safety cover sealing the front part of the grinder was removed, and an external safety screen was placed in its place. The system that we used as a first example is the disulfide exchange reaction between bis-2-nitrophenyldisulfide (named 1-1) and bis-4-chlorophenyldisulfide (named 2-2) in the presence of a small amount of base catalyst 1,8-diazabicyclo[5.4.0]undec-7-ene (dbu) to produce upon ball mill neat grinding (NG) and LAG the compound 4-chlorophenyl-2-nitrophenyl-disulfide (named 1-2).26,27 The latter is formed by ball mill grinding as two different polymorphs, Form A and Form B. For many different LAG solvents, Form A is the thermodynamic product under ball mill NG conditions or when not enough solvent is used in the grinding reaction taken to equilibrium, while Form B is obtained as the thermodynamic product under ball mill LAG conditions at equilibrium when enough solvent is added to the milling jar.Indeed Form A can be obtained from Form B under ball mill NG, while Form B can be obtained from Form A under ball mill LAG. Such direct transformation in milling experiments has been reported before in other systems,28,29 and it has been reported that the nature and concentration of solvent determine the polymorph obtained under LAG conditions.30 Our published experimental results include the investigation of milling equilibrium curves for a range of organic solvents. Here the equilibrium phase composition ratio R = [Form B] / ([Form A] + [Form B]) is plotted against the volume of LAG solvent added for each experiment. The onset of the equilibrium curve and the sharpness of the curve were found to depend on the nature and molar amount of solvent added to the milling jar. Figure 1: Reaction scheme of the ball mill grinding experiments and key concept of solvent equilibrium curves using the R value. These equilibrium curves shows graphically the effect of the addition of a few drops of solvent (x axis) on the phase composition of the product (y axis) when ball mill grinding for long enough to achieve equilibrium conditions. The bottom part of the graph accounts for Form A being quantitatively formed, the top part of the graph for Form B being quantitatively formed while a mixture of Form A and Form B is formed for the volume range of the solvent accounting for the sigmoidal part of the graph. This figure has been reprinted with minor changes from the Supplementary information in Chem. Sci., 2016, 7, 6617 (Ref. 25). Please click here to view a larger version of this figure. Thermodynamic aspects are general and must apply to any given milling system. As a further example to show the generality of our observations, an analogous equilibrium curve was also produced for a second system: the two polymorphs of 1:1 co-crystal of theophylline (tp) with benzamide (bzm), form I and form II, where the outcome depends on the volume of water in the grinding mixture.25 These phase composition versus solvent concentration equilibrium curves are essential for investigating the interaction between the nanocrystal surfaces and the solvent molecules at equilibrium on ball mill grinding reactions. Our results demonstrate that some equilibrium curves are very sharp, showing an "all-or-nothing" behaviour, which is characteristic of particles with a large number of adsorption sites and positive cooperativity of the binding process.31 Shallower equilibrium curves indicate a lower level of cooperativity and suggest the presence of a third phase at equilibrium, possibly an amorphous phase involving the solvent itself. Such milling equilibrium curves have been produced for no other system to our knowledge. We believe this to be partly due to the inherent sensitivity of the solid state system to even very small environmental changes under ball mill LAG conditions. Preparation of good and reliable solvent concentration curves can only be achieved if the experimentalists carefully validate their pipetting skills with training sets and if they fully understand (i) how pipettes and syringes work and (ii) if the equipment they have selected for delivering accurate and precise volume of a solvent is suitable to perform the intended job. The delivery of an exact volume of solvent can be accomplished with a variety of equipment, this being pipettes or syringes and their choice can depend on availability, user preference and skills, vapor pressure of the solvent used and intended application for the ball mill grinding experiments. Pipettes are commercially available as air displacement or positive displacement covering many solvent ranges. Both types of pipettes are commercially available as manually operated or electronically automated. Automatic pipettes are generally preferred as they are less dependent on the experimentalist skills to be able to aspirate or dispense a solvent evenly at a given speed. The experimentalist must rely on the capability of the pipettes to deliver the exact volume of solvent. This can only happen if the pipettes are accurate to start with, well maintained, serviced and periodically calibrated. Typically, external pipette calibration services will calibrate pipettes to the ISO 8655 standard using water as the solvent. Therefore, for each organic solvent the experimentalist should validate their accuracy and precision of pipetting through accurate weighing experiments over the intended volume range to be dispensed. The most commonly used solvent delivery equipment is the air displacement pipettes to which a tip needs to be fitted to the syringe barrel. They work on an air-cushion principle; upward movement of the piston produces a partial vacuum in the tip, causing the liquid to be drawn into the tip which is separated from the end of the piston by the air cushion. The vapor phase of the pipetted solvent will start to equilibrate within the air cushion, the extent of evaporation will depend on its vapor pressure. Pre-wetting is crucial when using variable-volume pipettes set at their lowest volume range, since the ratio of airspace to liquid and the potential for evaporation increases dramatically as compared to when the pipette is set at the top of its volume range. The experimentalist will know when this equilibrium is achieved, as the solvent aliquot will be hanging but separated from the end of the piston as from a spring, the solvent at the end of the tip staying firm when the pipette is held in vertical position over a few seconds: the solvent inside the tip should not sag or drip. Air displacement pipettes can be used in two modes; the most generally used is the forward pipetting mode where all the aspirated solvent is quantitatively dispensed by one full movement of the piston. The other mode is the reverse pipetting mode; in this mode a calculated excess of solvent is aspirated by the pipette, and therefore after quantitative dispensing, a residual volume of solvent remain in the pipette tip which needs to be disposed to waste. Reverse pipetting mode can be more suitable for viscous and dispensing very small volume of solvents. However, for high vapor pressure solvents like dichloromethane (DCM) or diethyl ether, equilibration in the air displacement pipette cannot be easily achieved. Positive displacement pipettes or syringes are more suitable in this case. We propose that equilibrium phase composition versus solvent concentration curves could be obtained for any system under sufficiently well-designed, performed and controlled ball mill LAG conditions. NOTE: Air displacement pipettes in reverse pipetting mode were selected for a range of LAG solvents (acetone, acetonitrile (MeCN), tetrahydrofuran (THF), ethyl acetate (EtOAc), chloroform (CHCl3) and dimethylformamide (DMF)) because they soaked very efficiently into the powders of the starting materials (1-1 and 2-2). Preliminary calibration of the reverse pipetting mode with this range of solvents had given more accurate and precise dispensing of the volumes in comparison to forward pipetting mode. The use of reverse pipetting mode allowed the quantitative transfer of the volume of dispensed solvent to the powder inside the grinding jar by resting the pipette tip on the inside wall of the jar at the end of the dispensing process. Any solvent adhered to the stainless steel wall of the jar would be quickly and quantitatively adsorbed by the powder during grinding. An inherent part of this strategy was to avoid contact of the wet pipette tip with the powders as it would strongly clump around the wet pipette tip, making the experiment void. Use a 5 figure balance. For the collection vessel use a capped 2 mL glass vial. Set the 5 to 120 µL electronic air displacement pipette to "reverse pipetting" mode, set the aspiration and the dispensing speed to the lowest value. Set the volume, for example, to 10.0 µL. Fit the pipette's nozzle to the pipette tip with a firm vertical movement to achieve a perfect seal. Do not twist or move the pipette sideways during the fitting as this will damage the pipette tip and compromise the seal. Pre-wet the pipette 5 times by aspirating and dispensing 10.0 µL in a continuous sequence with the selected solvent. Aspirate immediately after pre-wetting, 10.0 µL solvent ensuring the pipette is held vertically. Immerse the tip 2-3 mm under the liquid surface. In "reverse pipetting" mode a set excess of solvent is automatically aspirated. Dispense the 10 µL volume to a tared capped vial, ensuring the pipette is held at a 30-45o angle to the inside wall of the glass vial. Gently tap the end of the tip against the inside of the glass vial to capture any exposed droplet left at the tip. Cap the vial immediately and weigh it. Record the weight. Dispose of to waste the set excess of solvent inside the tip. Replace the pipette tip for a new one. Repeat point 1.1.4 to 1.1.6 at least 3 times with the same set volume. Record the weights. Set now the volume of the pipette to a different value, i.e. 20.0 µL. Repeat point 1.1.4 to 1.1.7 using 20.0 µL volume. Do the same procedure with 30.0 µL, 40.0 µL, 50.0 µL, 60.0 µL, 70.0 µL, 80.0 µL, 90.0 µL and 100 µL. Dispense with a 1 µL precision for a narrower range required for the ball mill grinding experiment. For example: for acetonitrile, pipette between 20 µL and 27 µL with 1 µL precision. Repeat point 1.1.4 to 1.1.7 using 21.0 µL, 22.0 µL, 23.0 µL, 24.0 µL, 25.0 µL, 26.0 µL and 27.0 µL MeCN. Calculate the average weight. Divide the average weight by the density of the solvent to obtain the average value of the dispensed volume. Enter the values for the pipetted volume of solvent in µL in the x axis and the values in µL for the volumes calculated from the average weight in the y axis. Figure 5 shows an example of these graphs. NOTE: The correlation coefficient for the linearity graph should be r2> 0.99 for the wide range (10-100 µL) as well as for the narrow range (20-30 µL). a) Range 10-100µL MeCN; b) expanded narrow range from 20-30 µL MeCN. This figure has been reprinted with minor changes from the Supplementary information in Chem. Sci., 2016, 7, 6617 (Ref. 25). Please click here to view a larger version of this figure. NOTE: Air displacement pipettes in forward pipetting mode (the normal mode of pipetting) were selected for a range of LAG solvents (methanol (MeOH), ethanol (EtOH), isopropanol (IPA), dimethyl sulfoxide DMSO, benzene, toluene and water (H2O)) which did not soak or soaked much too slowly into the powders of the starting materials (1-1 and 2-2). Therefore it was critical to avoid dispensing any solvent on the internal walls of the jar or on the surfaces of the ball bearing as these solvent residues would not be adsorbed efficiently enough by the solid during grinding and therefore not take part in the ball mill grinding reaction. The strategy was to quantitatively transfer the volume of the solvent directly to the powder by resting the wet pipette tip on top of the powder at the end of the dispensing process without the risk of powder clumping around the wet tip. The use of reverse pipetting would have been unsuitable for this range of solvents, as the solvent residue that needs to stay in the pipette tip at the end of pipetting procedure would have been wrongly transferred by capillary action when the wetted tip was rested on powder and therefore dispensed more solvent than intended. Follow 1.1.1 to 1.1.2 but set the electronic air displacement pipette to "normal pipetting" mode. Set the volume, for example, to 65.0 µL for methanol, and follow step 1.1.4. Aspirate 65.0 µL methanol following instruction on 1.1.5. Under "normal pipetting" only the exact volume of solvent is automatically aspirated. Dispense the 65.0 µL methanol to the vial as in 1.1.6 to quantitatively transfer all the volume. Cap the vial immediately and weigh it. Record the weight and follow step 1.1.7. Set now the volume in the pipette to 25.0 µL and repeat point 1.2.2 to 1.2.4 using 25.0 µL. Do the same with 50.0 µL, 60.0 µL, 75.0 µL, 80.0 µL and 85.0 µL methanol. Dispense with a 1 µL precision between 63 µL and 70 µL for methanol. Repeat point 1.2.2 to 1.2.4 using 63.0 µL, 64.0 µL, 66.0 µL, 67.0 µL, 68.0 µL and 69.0 µL methanol. Follow 1.1.10. The wide range for methanol is 25 to 100 µL, and the narrow range is 60 to 79 µL. Clean the grinding jars by sonicating them in acetone. Wash with detergent, rinse with water and then with acetone. Dry the grinding jars in a drying cabinet at 70 °C for over 30 min. Allow the grinding jars to cool before use. Weigh 104.82 ± 0.1 mg of 1-1 crystals (0.34 mmol, 1.0 equivalent) using a 5 decimal figure balance. Transfer quantitatively the weighed powder to the male half of a 14 mL stainless steel snap-closure grinding jar. NOTE: It works best when a weighing boat is made of greaseproof weighing paper cut into a U-shape as the powder does not stick on the weighing boat when transferred. Make it small enough to fit easily inside the opening of the grinding jar to avoid spillage. As a precaution, use wide blade rounded tweezers, as they grip better, to transport the filled weighing boat from the balance to the inside of the grinding jar. Use them also later on to handle the ball bearings. Weigh 97.66 ± 0.1 mg of 2-2 crystals (0.34 mmol, 1.0 equivalent). Transfer the weighed powder quantitatively to the male half of the grinding jar. The jar already contains 1-1. Mix the two solids reagents inside the grinding jar thoroughly with a micro spatula. Insert two 7.0 mm diameter (1.37 g) hardened stainless steel ball bearings. Place them carefully on top of the powder. Pipette 2 µL dbu using a 1-10 µL pipette and deliver the base catalyst on the top of one of the two ball bearings. NOTE: Take care not to allow the ball bearing with dbu to roll over the powder. This would result in the powder being coated with dbu before grinding is started. Snap close the grinding jar. Ensure no gap is left at the junction. Secure the outside of the junction with insulating tape as an additional precaution. Install the grinding jar in the adjustable clamp from one of the two arms of the ball mill grinder. Tighten the screw on the safety clamp until the jar is immobilized. Turn the self-locking clamping device to the LOCK position to prevent the jar from being ejected while grinding. Ensure the other arm bears a similar weight to the jar so that the grinder is evenly balanced while grinding and does not become damaged. Install a safety screen in front of the grinder. NOTE: The build in safety screen has been removed from the ball mill grinder and replaced with an external safety screen. This is to avoid the heat venting from the motor heating up the sealed space where the grinding jars are installed and heating them during grinding. Set the frequency of the ball mill grinder to 30 Hz, and the timer to, for example, 5.0 min. Now, start the grinder by pressing the START button. When the time has elapsed, the grinder will stop automatically. Immediately, remove the insulating tape from the junction and open the grinding jar. Analyse the product immediately on completion of grinding. Run first the Powder X-ray diffractogram (PXRD) scan. Transfer the powder from the grinding jar to a small agate mortar. Break lumps with the agate pestle until powder is smooth. Transfer some powder into the 2 mm rectangular recess on the glass PXRD sample slide. Compress the powder with a glass slide to evenly flatten the powder surface to the same level as the rest of the glass slide. Remove the residual powder on the surface. Label the slide. Mount the PXRD sample slide on the slide bracket of the Powder Xray diffractometer. Scan the sample. The powder Xray diffractometer used is equipped with Cu Kα radiation and a detector operating in reflection geometry with the following parameters: range 5 to 45° in 2θ, step size 0.03°, time/step 100 s with a total time of 13 min, 0.04 rad soller, VxA 40x40. Close the PXRD door and start the PXRD scan on the Data Collector software. Perform a Rietveld refinement (Find Rietveld refinement guidelines in section 4.1) on the PXRD data collected. This gives the phase composition of the solid sample in %wt. Calculate the phase composition as %M of the starting materials 1-1 and 2-2 and each polymorph of the product Form A and Form B.
Analyse the chemical composition of the powder by High Performance Liquid Chromatography (HPLC). Prepare the sample diluent by adding 0.2 mL of trifluoroacetic acid (TFA) using a glass gas tight syringe to 100 mL of HPLC grade acetonitrile to form "MeCN+0.2% TFA" solution. Mix well. Prepare the sample solution for HPLC analysis at a concentration of 1mg/mL in "MeCN+0.2% TFA". Using a 5 figure balance, zero a 1.8mL clear HPLC glass vial. Add a small amount of the powder to reach a weight between 0.7 and 1.0 mg. Record the weight (e.g. 0.88 mg). Adjust a 1 mL automatic pipette to give a volume in µL equivalent to the amount weighed (e.g. 880 µL for 880 µg weighed). Pipette this volume of the sample diluent (MeCN+0.2%TFA). It should result in a 1 mg/mL sample solution. Cap the HPLC vial with a suitable HPLC cap with septa. Swirl the vial manually to get the powder in solution. Sonicate the vial for maximum 5 min to ensure that the powder is in solution. Check against the light to ensure there are no undissolved particles. This sample is now ready for HPLC analysis. Install a C18 HPLC column on the HPLC equipment. Install the inlet of the HPLC column on the outlet of the heat exchanger located in the column oven and the outlet of the HPLC column on the inlet of the ultraviolet/visible (UV/VIS) spectrophotometer flowcell. Prepare the HPLC system with Solvent A as "Water +0.1% Formic acid" and solvent B as "Acetonitrile +0.1% Formic". Purge the HPLC system with both solvents. Set the UV/VIS detector to λ = 260 nm, with an 8 nm bandwidth and the λREFERENCE = 550 nm with a 100 nm bandwidth. Set the injection volume to 1 µL and set the HPLC column heater to 60 °C. Equilibrate the HPLC column with 75% solvent B. Inject and run the solvent gradient from 75 to 85% solvent B over 2 min with a flow rate of 2 mL/min. Equilibrate over 1 min before the next injection. Inject the sample. 1-1 elutes at 0.55 min, 1-2 elutes at 0.9 min and 2-2 elutes at 1.65 min. NOTE The UV/VIS parameters are experimentally selected so that the peak area of 1-1 is the same as that of 2-2. 1-1 and 2-2 are expected to be always equimolar in this solid state reaction. The best match of the peak areas for 1-1 and 2-2 are obtained with the UV/VIS detector used with λ = 260 nm (peak width 8nm); λREF = 550 nm (peak width 100nm). Determine the peak area for each of these 3 peaks and calculate the total peak area. Calculate the % Peak Area Ratio (% PAR) by dividing the peak areas of individual peaks by the total peak area. Report the values obtained as concentration expressed as %M of 1-1, 2-2 and 1-2. These values are equivalent to their corresponding % PAR. Repeat the experiment (step 2.1.2 to 2.1.21) by only changing the length of the grinding time to 10 min, 15 min, 20 min, 25 min, 30 min, 32 min, 34 min, 36 min, 38 min, 40 min and 45 min as in 2.1.10. Always run an extra experiment after reaching equilibrium by grinding for longer time to ensure that the equilibrium level is constant. NOTE: These specific grinding times have been selected to define the exponential segment of the kinetic curve ending in equilibria following the initial delay period. At equilibrium, the phase composition is consistent with quantitative Form A while the chemical composition is consistent with 97% M of 1-2, 1.5% M of 1-1 and 1.5% M of 2-2. Plot the chemical composition obtained from HPLC analysis of 1-1, 2-2 and 1-2 as %M in the y-axis and the grinding time in min in the x-axis. This gives a kinetic curve for the chemical composition. Figure 3a shows an example of kinetic curve plotting the chemical composition of ball mill neat grinding versus grinding time. NOTE: Quantitative formation of 1-2 demonstrates that the experiment has reached thermodynamic equilibrium. Plot the phase composition obtained from the Rietveld refinement of 1-1, 2-2, Form A and Form B as %M in the y-axis and the grinding time in min in the x-axis. This gives a kinetic curve plotting the phase composition. Figure 3b) shows an example of kinetic curve for phase composition of ball mill neat grinding versus grinding time. Figure 2: Rietveld refinement plot example for the equilibrium mixture under milling conditions when using 67 µL methanol. Experimental pattern (black line), calculated pattern for Form A (blue), calculated pattern for Form B (red), and difference pattern (grey). The refinement converged with Rwp=10.82% and χ2 = 2.65. For this specific example the R ratio was 41%, and crystal size was estimated to be 71 and 86 nm for Form A and Form B respectively. Please click here to view a larger version of this figure. Figure 3: Kinetic curves obtained for the ball mill neat grinding reaction of 1-1 +2-2 +2%M dbu (a,b). No fitting was performed - the lines are only a guide to the eye. The graph shows the composition of reactants (1-1 & 2-2) and the heterodimer formed (Form A and Form B) as %M versus grinding time a) HPLC analyses showing chemical composition of the powder at each kinetic point; b) Rietveld refinement of PXRD scans showing phase composition of the powder at each kinetic point. It demonstrates that Form A is exclusively formed while Form B is not formed at any kinetic point. Reprinted with permission from JACS, 2014, 136, 16156 (Ref. 27). Copyright 2014 American Chemical Society. Please click here to view a larger version of this figure. Follow step 2.1.2 to 2.1.6. Dispense 50 µL MeCN over the powder with a 100 µL pipette avoiding contact of the wet pipette tip with the powder. See Section 1.1 and 1.2 on recommended procedures for pipetting organic solvents in reverse pipetting and normal pipetting mode. NOTE: Do not touch the powder with the pipette tip containing MeCN residue. The powder will immediately clump around the wet pipette tip resulting in poor stoichiometry for the powder and the solvent. This will affect the kinetics and make the experiment void. Any manual pipette or any automatic pipette in reverse pipetting or normal pipetting will be suitable for this experiment. 50 µL MeCN is well in excess of the 23 µL MeCN required to perform this reaction. Therefore precise pipetting is not required here. Follow step 2.1.7 to 2.1.12. Analyse the phase composition by Rietveld refinement as in steps 2.1.13 to 2.1.15 and the chemical composition by HPLC as in 2.1.16 to 2.1.21. NOTE: Form A is never observed under ball mill LAG conditions. Repeat the experiment (step 2.2.1. to 2.2.4) by only changing the length of the grinding time to 10 min, 13 min, 14 min, 15 min, 17 min, 18 min, 20 min, 25 min and 30 min. Always run an extra experiment after reaching equilibrium by grinding for longer time to ensure that the equilibrium level is constant. NOTE: These grinding times have been selected to define the exponential segment of the kinetic study ending in equilibria following the initial delay period. At equilibrium, the phase composition is consistent with quantitative Form B while the chemical composition is consistent with 97%M of 1-2, 1.5%M of 1-1 and 1.5%M of 2-2. No fitting was performed - the lines are only a guide to the eye. The graph shows the composition of reactants (1-1 & 2-2) and the heterodimer formed (Form A and Form B) as %M versus grinding time a) HPLC analyses showing chemical composition of the powder at each kinetic point; b) Rietveld refinement of PXRD scans showing phase composition of the powder at each kinetic point. It demonstrates that Form B is exclusively formed while Form A is not formed at any kinetic point. Reprinted with permission from JACS, 2014, 136, 16156 (Ref. 27). Copyright 2014 American Chemical Society. Please click here to view a larger version of this figure. Follow all steps in Section 2.1. Grind only for 45 min at 30 Hz which suffices to reach equilibrium. NOTE: Form A is quantitatively formed. The chemical composition of the product is consistent with 97%M of 1-2, 1.5%M of 1-1 and 1.5%M of 2-2. Follow all steps in Section 2.2. Grind only for 30 min at 30 Hz which suffices to reach equilibrium. NOTE: Form B is quantitatively formed. The chemical composition of the product is consistent with 97%M of 1-2, 1.5%M of 1-1 and 1.5%M of 2-2. 3. Preparation of Form A and/or Form B by ball mill LAG using different types and volumes of organic solvents as LAG solvents. NOTE: Procedure 1 has been designed for LAG solvents which exhibit high affinity for the equimolar mixture of 1-1 and 2-2. Examples are MeCN, Acetone, THF, DMF, EtOAc, and CHCl3. As an example of this procedure we will discuss the addition of 17.0 µL acetone as LAG solvent. Follow 2.1.1 to 2.1.6 but use a 14 mL screw closure grinding jar. NOTE: For these precise LAG experiments, use screw-closure stainless steel grinding jars with a Teflon seal incorporated at the junction so as to trap quantitatively the solvent and the solid during grinding inside the jar. A snap closure grinding jar can leak solvent from the junction. Fix the bottom part of the male half of the grinding jar to the bench with re-usable adhesive putty, to prevent the ball bearings from rolling later in the procedure. Set the electronic air displacement pipette to "reverse pipetting", the aspirating and dispensing speed to the slowest setting and the volume, for example, to 17.0 µL for acetone. Follow the procedures discussed for the use of "reverse pipetting" in Section 1.1. Take special care to homogenously drip the 17.0 µL acetone on the exposed surface of the powder. NOTE: Do not touch the powder with the pipette tip containing acetone residue. The powder will immediately clump around the wet pipette tip resulting in poor stoichiometry for the powder and the solvent. This incident will make the experiment void. There is no problem with a high affinity solvent being left on the inside wall of the grinding jar or on that ball bearing which is not loaded with dbu. These solvents have such a high affinity for the powder, that they will be quantitatively absorbed by the powder during grinding. Take the empty female half of the grinding jar and carefully screw it on the male half containing the powder. Do this as soon as possible after the addition of acetone. Screw tight to ensure that the Polytetrafluoroethylene (PTFE) washer makes a leak-proof seal. Tape the outside of the junction securely with insulating tape as an additional precaution. Follow 2.1.8 to 2.1.12 but set the timer to 45 min. NOTE: Preliminary kinetic experiments using acetone as the LAG solvent have demonstrated that 45 min grinding suffices for the ball mill grinding reaction reaching the desired equilibrium. Analyse the phase composition by PXRD as in 2.1.13 to 2.1.15 and the chemical composition by HPLC as in 2.1.16 to 2.1.21. NOTE: it is critical for these experiments that the analysis by HPLC is consistent with quantitative formation of 1-2 demonstrating that the solid state reaction has reached thermodynamic equilibrium. Calculate the term R. R is the ratio between the % mol of Form B and the %mol of total amount of heterodimer 1-2 = Form A+ Form B.
Repeat step 3.1.1 to 3.1.8 by pipetting different volumes of the same solvent (acetone) to define the equilibrium curve (see 3.1.9 below). Perform grinding experiments by independently adding 10.0µL, 14.0µL, 15.0µL, 16.0µL, 18.0µL, 20.0µL, 30.0µL and 50.0µL acetone to the powder. Plot the equilibrium curve for acetone by entering the %R values in the y-axis and the µL acetone added in the x-axis. The x-axis is expressed as µL acetone per 200 mg of powder or mol acetone per mol of total powder. NOTE: In the case of acetone, the addition of 16 µL or less of acetone results in quantitative Form A (0%R) while the addition of 17 µL or more of Acetone results in quantitative Form B (100%R). An example of the chemical and phase analysis leading to the solvent equilibration curve of ball mill LAG grinding using DMF as LAG solvent can be seen in Figure 7. 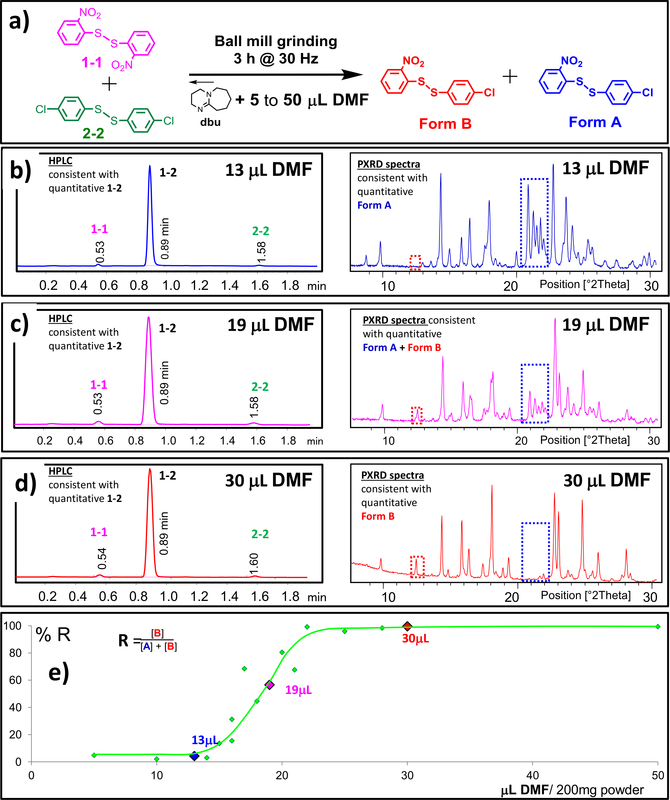 HPLC chromatograms and PXRD scans for 3 examples: at equililbrium, the addition of b) 13µL DMF results in quantitative Form A, c) 30 µL DMF results in quantitative Form B and d)19 µL DMF results in a mixture of Form A and Form B. e) THF equilibration curve is shown for all the 17 experiments performed with DMF, plotting the %R determined versus the µL DMF added to the 200 mg powder. This figure has been reprinted from the Supplementary information in Chem. Sci., 2016, 7, 6617 (Ref. 25). Please click here to view a larger version of this figure. NOTE: Procedure 2 is suitable for LAG solvents which exhibit very low affinity for the equimolar mixture of 1-1 and 2-2. Examples are methanol, ethanol, isopropanol, dimethyl sulfoxide, benzene, toluene, cyclohexane and water. As an example we will discuss the addition of 65.0 µL methanol as LAG solvent. Transfer around 60 mg of the mixture to a weighting boat. Reserve it for later use. Set the electronic air displacement pipette to "normal pipetting", the aspirating and dispensing speed to the slowest setting and the volume, for example, to 65.0 µL for methanol. Follow the procedures discussed for the use of "normal pipetting" mode in Section 1.2. Drip the 65.0 µL methanol homogenously on the exposed surface of the powder. Take care during dispensing of methanol not to drip or touch the inside walls of the jar. Rest the wet pipette tip on the surface of the powder to quantitatively deliver the volume of methanol.The powder will not clump on contact with the wet end of the pipette tip. NOTE: The kinetics of absorption of these solvents into the powder is very slow. Therefore any solvent not directly in contact with the powder will not take part in the ball mill grinding reaction giving results consistent with having added less solvent. Pour the powder left in reserve over the wetted patches of powder in the grinding jar. This should trap the solvent inside the powder. Tap carefully the jar to compact the wetted powder. Cap the male half with the empty female half of the grinding jar. Take care not to roll onto the powder the ball bearing loaded with dbu. Leave the grinding jar to stand undisturbed over 20 min. This should enable the solvent to soak into the powder. After the soaking period has elapsed, screw tightly the junction in the grinding jar to ensure that the PTFE washer makes a leak-proof closure. Tape the junction securely with insulating tape as an additional precaution. Set the ball mill grinder frequency to 30 Hz, and the timer to 60 min. The grinder needs to run for 4 sets of 60 min. This is automatically done with the homemade "Push Button" setup. 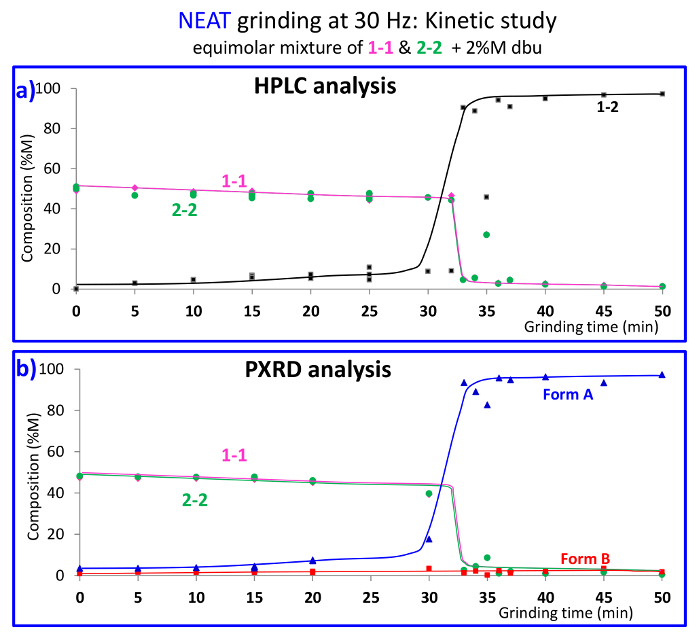 NOTE: Preliminary kinetic experiments have demonstrated that over 3 to 4 h is required for the ball mill grinding reaction reaching the desired equilibrium with methanol as the LAG solvent. Launch the "Push a Button" software application. Enter the 4 values required to initialize grinding and to keep grinding over the period of hours required. Number of pushes: 4; Push hold (s): 10; Push Period (min):65; Com Port Number: 3. Click on the START button in the "Push a Button" software and grinding will start. The grinder will automatically stop after 60 min grinding as set on the ball mill grinder. The software on reaching 65 min will send an instruction to activate the solenoid to press down the ball mill grinder START button and restart grinding. This cycle will be repeated as many times as requested in the "Push Button" software. NOTE: On clicking the START button on the "Push a Button" software, the relay will activate the solenoid situated in a fixed position directly over the START button from the ball mill grinder. The solenoid will immediately hit the START button on the MM400 grinder, initialling the grinding. The solenoid will release its grip on the START button after the set number of seconds entered in the Push hold. It is recommended to allow the grinder to rest for 5 min between periods of 60 min grinding time and the start of the next grinding session to prevent the motor from overheating. Analyse the phase composition by Rietveld refinement as in 2.1.13 to 2.1.15 and the chemical composition by HPLC as in 2.1.16 to 2.1.21. Calculate the term R as in 3.1.8. Repeat the full procedure with different volumes of the same solvent to define the equilibrium curve. In this example, perform independent experiments with 25.0 µL, 50.0 µL, 60.0 µL, 63.0 µL, 64.0 µL, 66.0 µL, 67.0 µL, 68.0 µL, 69.0 µL, 70.0 µL, 75.0 µL, 80.0 µL and 85.0 µL methanol. Plot the solvent equilibrium curve as in 3.1.10. NOTE: In the case of methanol, the addition of 64µL or less of methanol results in quantitative Form A (0%R) while the addition of 68 µL or more of methanol results in quantitative Form B (100%R). An example of the solvent equilibration curve of ball mill LAG grinding using MeOH as LAG solvent can be seen in Figure 6b. NOTE: The addition of benzene, toluene, cyclohexane and water to the equimolar mixture of 1-1 and 2-2 results always after ball mill grinding in the formation of Form A; Form B is not formed. No fitting was performed - the line is only a guide to the eye. The equilibrium curve (%R versus µL Methanol added to 200 mg powder) in a) gives very poor correlation using experimental Procedure 1 while in b) there is a good correlation when using experimental Procedure 2. This figure has been reprinted from the Supplementary information in Chem. Sci., 2016, 7, 6617 (Ref. 25). Please click here to view a larger version of this figure. NOTE: The solid state phase composition of the powder mixtures as obtained at the end of the milling experiment is studied by Rietveld refinement of ex-situ powder diffraction data.32 Some guidelines are here given. Minimize the number of structural and microstructural variables and background parameters necessary to obtain a good a fit with the Rietveld refinement software of choice - the fewer the refined parameters, the smaller the estimated standard deviations. NOTE: Preliminary structural refinements of pure single phase milled samples are helpful in this sense, as they allow to optimize the structural model and address complications such as preferred orientation crystallographic directions. The ones we identified were (0 1 0) for 1-1; (0 0 1) for 2-2; (1 0 2) and (0 0 1) for Form A; (0 1 0) for Form B. Rietveld refinement is performed with the assumption that 1-1 and 2-2 are always equimolar: constrain the scale factors of 1-1 and 2-2 together in order to achieve that. NOTE: The agreement between PXRD and HPLC analysis was found to be excellent (see Figure 3 and Figure 4). Perform Rietveld refinements with a commercial software.34 However there are a number of freeware and commercial Rietveld refinement softwares that can be used for the same purposes. Refine the instrumental contribution to peak broadening to reduce the number of peak shape parameters. Use a specific crystalline standard such as Lanthanum hexaboride (LaB6) or Yttrium(III) oxide (Y2O3) to study the instrumental contribution to line broadening of PXRD data prior to the collection of any experimental data. Run the slide with LaB6 as described in steps 2.1.13 to 2.1.14. Retrieve the crystal structure model of the standard from the Crystallographic Open Database,35 and make a Rietveld refinement of the standard assuming no contribution to peak broadening from the standard itself. When performing the Rietveld refinement of Form A and/or Form B use the peak shape parameters as refined for the standard and include terms that account for sample contribution to line broadening in the peak shape function.36 A single isotropic term for crystal size contribution to line broadening was found to work well in our examples. This protocol is always started by the experimentalist validating his or her pipetting skills and inspecting the quality and performance of the pipettes or syringes used. This is best done by performing training sets on pipetting accurate volumes of the specific solvent intended to be used for the ball mill grinding experiments. The accuracy of the dispensed volumes is validated by weighing checks and this validation is repeated until the desired accuracy and precision is achieved. This validation has to be done for each solvent used for the ball mill grinding experiments. Figure 5 shows an example of such a validation of the accurate pipetting with acetonitrile. 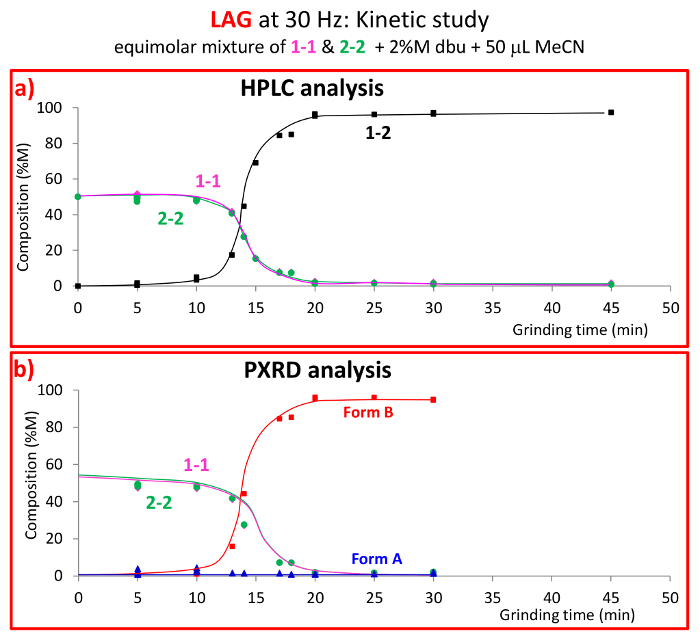 HPLC data was collected to obtain the chemical composition and PXRD scans were collected to obtain the phase composition of the powder from ball mill grinding reactions (See Figure 1 for the reaction scheme and the key concept of solvent equilibrium curves). 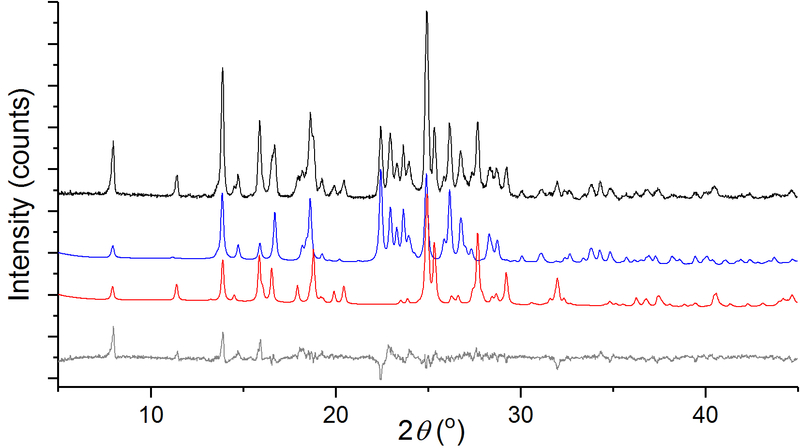 HPLC data quantifies the chemical composition as %M of the 2 homodimers (1-1 and 2-2) and the heterodimer (1-2) in the powder. Rietveld refinement prepared from the PXRD scans is used to quantify the phase composition as %M of the homodimers starting materials (1-1 and 2-2) and the two polymorphs (Form A and Form B) of the heterodimer product 1-2. HPLC can be used therefore to validate the accuracy of the phase composition results obtained by Rietveld refinement on the same samples; the combined concentration of Form A and Form B as %M determined by PXRD should equate with the concentration of 1-2 as %M determined by HPLC, while 1-1 and 2-2 should have the same concentration in %M determined by HPLC and PXRD. This is clearly shown on Figure 3 and Figure 4 where there is a good correlation between the kinetic curves plotting the chemical composition obtained by HPLC analysis and the kinetic curves plotting the phase composition obtained by PXRD analysis. The success of the preparation of accurate and precise solvent equilibrium curves for the ball mill grinding reaction relies on 3 factors: a) accurate and precise pipetting by the experimentalist; b) knowing when the ball mill grinding reaction has achieved equilibrium, which can be learned by performing the relevant kinetic studies as shown in Figure 3 and Figure 4; and c) by using the right experimental procedure for each solvent. The equilibrium curve in Figure 7 demonstrates good correlation between %R and the µL of DMF added to the grinding reaction when using experimental procedure 1. 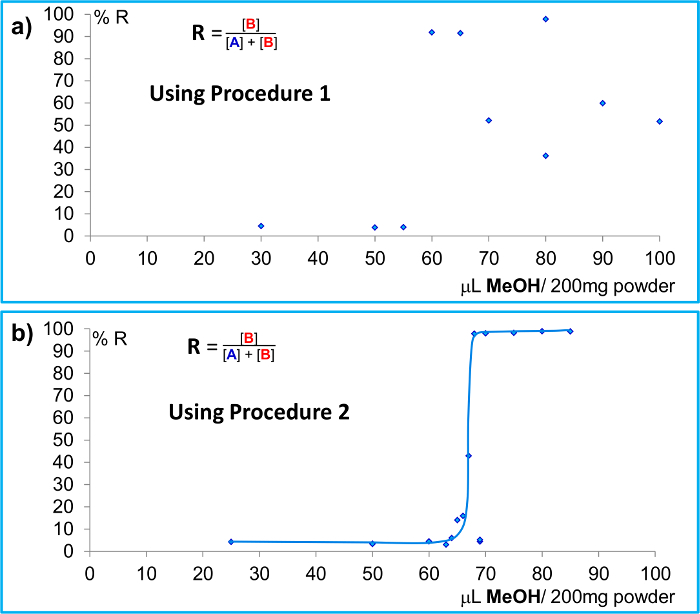 However, experimental procedure 1 gives very poor correlation between %R and the µL of methanol added to the grinding reaction as shown in Figure 6a, while the use of experimental procedure 2 for methanol gives good correlation as shown in Figure 6b. Figure 8 shows individually and combined how different solvents (MeCN, Acetone, THF, EtOAc, DMF, CHCl3, DCM, MeOH, EtOH, IPA and DMSO) results in different solvent equilibrium curves for the ball mill LAG reactions. Figure 8 demonstrate that good correlation between %R and the amount of solvent added to the ball mill grinding reaction can be achieved if care and good experimental design is applied when performing these experiments. While most of the literature on mechanochemistry focuses either on pragmatic outcomes or on reaction mechanisms, this paper addresses the thermodynamic end point of ball mill grinding. From this perspective, kinetic studies are a necessary step to the definition of the final equilibrium plateaus. Through our kinetic and final equilibrium studies, we know that the ball mill grinding reactions here discussed are driven by thermodynamics, resulting in the most stable polymorph composition under the given milling conditions. This is also the first time to our knowledge that experimental preparation methods - such as pipetting methods and milling jar setup - for mechanochemical experiments are presented and discussed in detail. It is critical to the successful outcome of the ball mill LAG experiments that a preliminary kinetic study is undertaken to establish for how long the ball mill grinding experiment needs to run to reach equilibrium. Under thermodynamic conditions ball mill grinding reactions can present three scenarios discussed in this manuscript; a) adding not enough volume of the given solvent for the ball mill grinding reaction, in which case the outcome is the quantitative formation of Form A; b) using at least enough volume of the given solvent, which results in the quantitative formation of Form B; c) the third case is in the gap between both extremes, where the skills, care and experimental design of the experimentalist become most important. The successful experimentalist will be able to demonstrate that the concentration of Form B increases with increased added solvent volume of the given solvent in a sigmoidal way until enough solvent is added to result in quantitative formation of Form B in a ball mill LAG reaction. For some solvents this change is so sharp that a difference of just 1 µL suffices to obtain quantitatively either Form A or Form B, as in the case of acetonitrile and acetone. Figure 8 summarizes this discussion. Figure 8: Individual and combined solvent milling equilibrium curves plotted as solvent concentration versus %R index. No fitting was performed - the lines are only a guide to the eye. Solvent investigated are: MeCN, acetone, THF, DMF, EtOAc, CHCl3, DCM, DMSO, MeOH, EtOH, IPA and water. Water does not lead to the formation of Form B. The dispensing of DCM as LAG solvent was performed with a gas tight glass syringe. This figure has been reprinted from the Supplementary information in Chem. Sci., 2016, 7, 6617 (Ref. 25). Please click here to view a larger version of this figure. Since thermodynamic concepts are general, milling equilibria as a function of solvent concentration under ball mill LAG conditions should be amenable to study for virtually for any given system setting up analogous procedures. There is therefore the potential to explore and discover new polymorphs by variation of added solvent, which may have practical implications in various industrial settings, and this includes most organic and inorganic reactions, as well as supramolecular compounds. Laboratory environment (temperature, atmospheric pressure, humidity) during sample preparation and experiments can affect the kinetics and equilibrium end point of the milling process - see Tumanov et al. (2017)37 as an example. In our experience, even small variations in size and shape of the milling jar and ball bearings - as well as the material they are made of - and total amount of powder can significantly affect the reaction rate and final equilibrium of the milling experiments. The experimentalist needs to take great care in the design and performance of these experiments, considering: (i) what pipetting technique has to be adopted for a specific solvent; (ii) how compounds have to be added to the milling jar and mixed; (iii) the size and shape of the milling jar and ball bearings; (iv) whether a stainless steel or a transparent material - which is necessary for in-situ techniques such as Raman21,38 - should be adopted for the milling jar and ball bearings. Perspex jars are easily damaged by many solvent used with LAG and solvents used for cleaning the jars. 3D printing of transparent jars from polylactic acid (PLA) allows more intricate design of the external geometry of jars, which show good mechanical and chemical resistance compared with Perspex, and are therefore more suitable for ball-milling experiments.39 Equilibrium experiments must be performed as consistently as possible, both in the experimental procedure and hardware, i.e. using identical preparation methods, jars, ball bearings and total amount of powder. Care must be taken not to overgrind unnecessarily as decomposition can occur. For our disulfide system, decomposition products can be observed for example by HPLC analysis or NMR. If this happens, a decomposition kinetic study is necessary. Ball mill grinding must be performed for the shortest time that leads to equilibrium. The current experimental approach has limitations in that we are not controlling macroscopic temperature efficiently and do not know local temperatures within the steel reaction vessel. We are also currently unable to monitor the evolution of crystallinity, which refers to the degree of structural order in a crystalline solid and crystal morphology during the course of grinding. In a nanocrystalline powder, crystallinity is mostly related to the average crystal size, which can crucially affect the polymorph stabilities.25 Improvements in these areas would greatly enhance our ability to explore and understand underlying processes. AMB and JKMS are grateful to the EPSRC for financial support. We thank C. A. Bland for the design and the mechanical setup and P. Donnelly for the software design of the automation of the grinders for repeat grinding. We thank Richard Nightingale, Ollie Norris and Simon Dowe from the mechanical workshop for the manufacture of the grinding jars, and the Solenoid holder for the "Push a Button" setup and Keith Parmenter from the glass workshop at the Department of Chemistry for the manufacture of the glass sample PXRD slides. We thank C. A. Bland for the maintenance and repair of the screw closure grinding jars. We thank Professor Bill Jones for the use of the PXRD equipment at the Department of Chemistry and Professor Chris Hunter for the use of his laboratory facilities. We thank the Department of Earth Sciences (GIL) for general support. HPLC equipment Agilent HP1200 Series modular HPLC system HPLC high pressure binary pump, autosampler, Peltier type column oven with 6 µL heat exchanger and Diode Array Detector with a semi-micro flow cell (1.6uL, 6mm pathlength). "Push a Button" software Developed at Department of Chemistry Written in Visual Basic. It activates an electronically controlled switch (relay). "Push a Button" Relay KM Tronic USB one relay USB Relay Controller - One Channel - HyperTerminal ASCII commands. Connection to a PC's USB port using VCP (Virtual COM port). re-usable adhesive putty Bostik Blu-Tack Used to hold the jar fixed on the bench. James, S. L., et al. Mechanochemistry: opportunities for new and cleaner synthesis. Chem Soc Rev. 41, (1), 413-447 (2012). Braga, D., et al. Solvent effect in a "solvent free" reaction. CrystEngComm. 9, (10), 879-881 (2007). 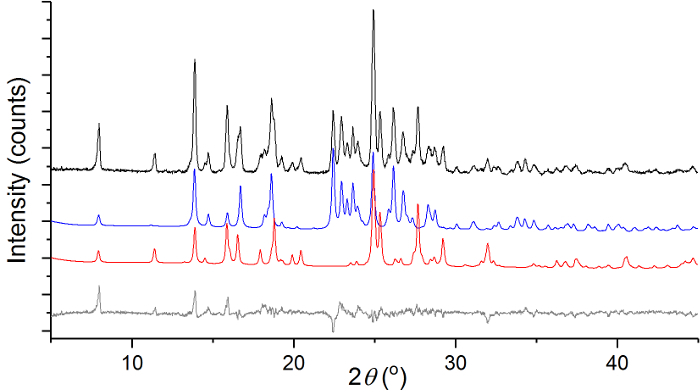 Karki, S., Friscic, T., Jones, W. Control and interconversion of cocrystal stoichiometry in grinding: stepwise mechanism for the formation of a hydrogen-bonded cocrystal. CrystEngComm. 11, (3), 470-481 (2009). Kaupp, G. Solid-state molecular syntheses: complete reactions without auxiliaries based on the new solid-state mechanism. CrystEngComm. 5, (23), 117-133 (2003). Biswal, B. P., et al. Mechanochemical synthesis of chemically stable isoreticular covalent organic frameworks. J Am Chem Soc. 135, (14), 5328-5331 (2013). Garay, A. L., Pichon, A., James, S. L. Solvent-free synthesis of metal complexes. Chem Soc Rev. 36, (6), 846-855 (2007). Kaupp, G. Mechanochemistry: the varied applications of mechanical bond-breaking. Cryst Eng Comm. 11, (3), 388-403 (2009). Morris, R. E., James, S. L. Solventless synthesis of zeolites. Angew Chem Int Ed Engl. 52, (8), 2163-2165 (2013). Stolle, A., Szuppa, T., Leonhardt, S. E., Ondruschka, B. Ball milling in organic synthesis: solutions and challenges. Chem Soc Rev. 40, (5), 2317-2329 (2011). Suryanarayana, C. Mechanical alloying and milling. Prog Mater Sci. 46, (1-2), 1-184 (2001). Wang, G. W. Mechanochemical organic synthesis. Chem Soc Rev. 42, (18), 7668-7700 (2013). Braga, D., Grepioni, F. Reactions between or within molecular crystals. Angew Chem Int Ed Engl. 43, (31), 4002-4011 (2004). Friscic, T., Childs, S. L., Rizvi, S. A. A., Jones, W. The role of solvent in mechanochemical and sonochemical cocrystal formation: a solubility-based approach for predicting cocrystallisation outcome. Cryst Eng Comm. 11, (3), 418-426 (2009). Fucke, K., Myz, S. A., Shakhtshneider, T. P., Boldyreva, E. V., Griesser, U. J. How good are the crystallisation methods for co-crystals? A comparative study of piroxicam. New J Chem. 36, (10), 1969-1977 (2012). Bennett, T. D., et al. Facile mechanosynthesis of amorphous zeolitic imidazolate frameworks. J Am Chem Soc. 133, (37), 14546-14549 (2011). Braga, D., et al. Mechanochemical preparation of molecular and supramolecular organometallic materials and coordination networks. Dalton Trans. (10), 1249-1263 (2006). Yuan, W., Friščić, T., Apperley, D., James, S. L. High Reactivity of Metal-Organic Frameworks under Grinding Conditions: Parallels with Organic Molecular Materials. Angew Chem Int Ed Engl. 122, (23), 4008-4011 (2010). Icli, B., et al. Synthesis of Molecular Nanostructures by Multicomponent Condensation Reactions in a Ball Mill. J Am Chem Soc. 131, (9), 3154-3155 (2009). Hsu, C. -C., et al. Solvent-free synthesis of the smallest rotaxane prepared to date. Angew Chem Int Ed Engl. 47, (39), 7475-7478 (2008). Boldyreva, E. Mechanochemistry of inorganic and organic systems: what is similar, what is different? Chem Soc Rev. 42, (18), 7719-7738 (2013). 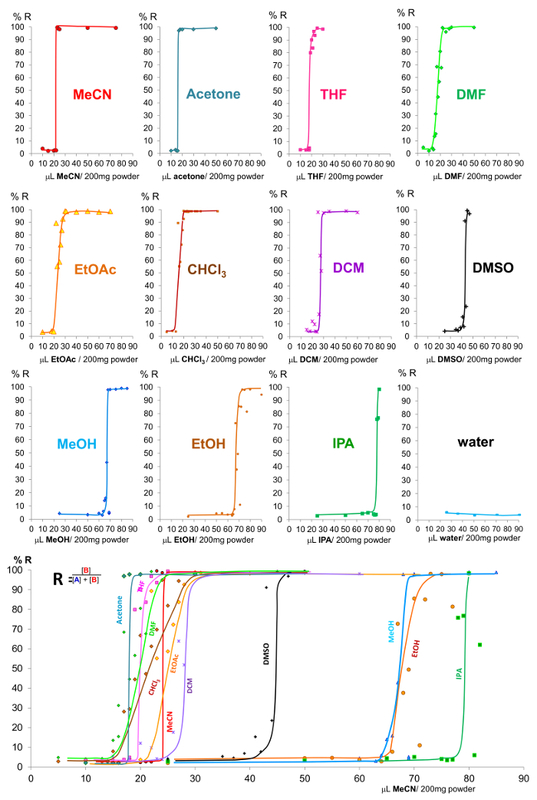 Gracin, D., Štrukil, V., Friščić, T., Halasz, I., Užarević, K. Laboratory Real-Time and In Situ Monitoring of Mechanochemical Milling Reactions by Raman Spectroscopy. Angew Chem Int Ed Engl. 53, (24), 6193-6197 (2014). Halasz, I., et al. In situ and real-time monitoring of mechanochemical milling reactions using synchrotron X-ray diffraction. Nat. Protocols. 8, (9), 1718-1729 (2013). Ma, X., Yuan, W., Bell, S. E. J., James, S. L. Better understanding of mechanochemical reactions: Raman monitoring reveals surprisingly simple 'pseudo-fluid' model for a ball milling reaction. Chem Commun. 50, (13), 1585-1587 (2014). Tumanov, I. A., Michalchuk, A. A. L., Politov, A., Boldyreva, E., Boldyrev, V. V. Inadvertent Liquid Assisted Grinding: A Key to "Dry" Organic Mechano-Co-Crystallisation? CrystEngComm. 19, 2830-2835 (2017). Belenguer, A. M., Lampronti, G. I., Cruz-Cabeza, A. J., Hunter, C. A., Sanders, J. K. M. Solvation and surface effects on polymorph stabilities at the nanoscale. Chem Sci. 7, (11), 6617-6627 (2016). Belenguer, A. M., Friscic, T., Day, G. M., Sanders, J. K. M. Solid-state dynamic combinatorial chemistry: reversibility and thermodynamic product selection in covalent mechanosynthesis. Chem Sci. 2, (4), 696-700 (2011). Belenguer, A. M., Lampronti, G. I., Wales, D. J., Sanders, J. K. M. Direct Observation of Intermediates in a Thermodynamically Controlled Solid-State Dynamic Covalent Reaction. J Am Chem Soc. 136, (46), 16156-16166 (2014). Evora, A. O. L., et al. Resolved structures of two picolinamide polymorphs. Investigation of the dimorphic system behaviour under conditions relevant to co-crystal synthesis. CrystEngComm. 14, (24), 8649-8657 (2012). Trask, A. V., et al. Selective polymorph transformation via solvent-drop grinding. Chemical Communications. (7), 880 (2005). Hasa, D., Miniussi, E., Jones, W. Mechanochemical Synthesis of Multicomponent Crystals: One Liquid for One Polymorph? A Myth to Dispel. Cryst Growth Des. 16, (8), 4582-4588 (2016). Hunter, C. A., Anderson, H. L. What is cooperativity? Angew Chem Int Ed Engl. 48, (41), 7488-7499 (2009). McCusker, L. B., Dreele, R. B. V., Cox, D. E., Louër, D., Scardi, P. Rietveld refinement guidelines. J Appl Crystallogr. 32, (1), 36-50 (1999). Allen, F. The Cambridge Structural Database: a quarter of a million crystal structures and rising. Acta Crystallogr Sect B. 58, (3 Part 1), 380-388 (2002). Coelho Software. TOPAS-Academic v.version 4.0. Available from: http://www.topas-academic.net/ (2006). Gražulis, S., et al. Crystallography Open Database-an open-access collection of crystal structures. J Appl Crystallogr. 42, (4), 726-729 (2009). Cheary, R. W., Coelho, A. A fundamental parameters approach to X-ray line-profile fitting. J Appl Crystallogr. 25, (2), 109-121 (1992). Batzdorf, L., Fischer, F., Wilke, M., Wenzel, K. J., Emmerling, F. Direct In Situ Investigation of Milling Reactions Using Combined X-ray Diffraction and Raman Spectroscopy. Angew Chem Int Ed Engl. 54, (6), 1799-1802 (2015). Tumanov, N., Ban, V., Poulain, A., Filinchuk, Y. 3D-printed jars for ball-milling experiments monitored in situ by X-ray powder diffraction. J Appl Crystallogr. 50, (4), 994-999 (2017).